It can be tedious to heed grammatical rules and stylistic conventions, and colloquial speech doesn’t necessitate strict adherence. When writing formally, however, following these rules isn’t just a way to obey some arbitrary grammar gods, but a way to ensure clarity and avoid ambiguity. 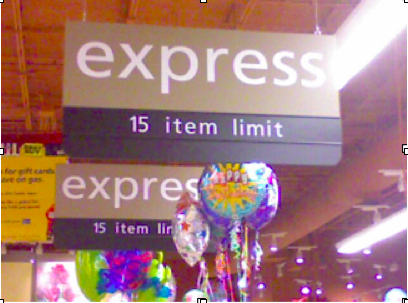 A supermarket cleverly avoids the “less or fewer” question. -“Myself” – people love to use this word superfluously, and it always sounds like they’re making royal decrees. “Myself” is only necessary when you’re: 1) emphasizing that you, not someone else, did something, or that you, perhaps unexpectedly, did something (“I gave it to him myself,” “I myself was a chef”); 2) expressing a reflexive action (“I slapped myself on the forehead,” “I gave myself a start” – you wouldn’t say, “I slapped me”). -“Who” vs. “whom” – an oldie but goodie. “Who” is used when it’s the subject of a sentence, “whom” when it’s the object. To figure out which is correct, substitute it for “him” (object) or “he” (subject) – which one sounds wrong? “Whom did you meet?”  “Did you meet him?” (Not “did you meet he?”) “Whom” is pretty rare in colloquial speech, but should still be respected in writing. -“That” vs. “which” – “that” is used to relate information essential to the meaning of the clause, while “which” is used for additional information. So, if you’re trying to name a certain painting with a unicorn in it, you would need to say “I bought a painting that depicts a unicorn.” If the painting happens to have a unicorn, then you would say, “The painting I bought, which depicts a unicorn, cost $50.” This same rule can help guide your use of commas: “The actress who won the award wasn’t present at the ceremony.” This is the equivalent of “that” – the fact that she won the award is crucial to the meaning. The equivalent of “which” would be using commas: “The up-and-coming actress, who won last year’s award, lives in New York.” The choice of “that,” “which,” and commas is essential to clearly conveying the writer’s intention. What are your grammatical pet peeves? Any thoughts on these rules? For more writing tips from our editors, click here. I always struggle to remember all those rules! Thanks for the reminders. You present it in ways that makes me feel like I will remember it!